Prishtinë, October 19, 2018 – The accelerating growth rate of the digital economy in Kosovo and globally as well are a continuous threat to the safety of citizens and businesses also, therefore measures should be also be undertaken by institutions and citizens in order to increase the efficiency of security systems from cyber crimes. This was said today during the roundtable organized by the American Chamber of Commerce in Kosovo on the occasion of the Cyber Security Month. 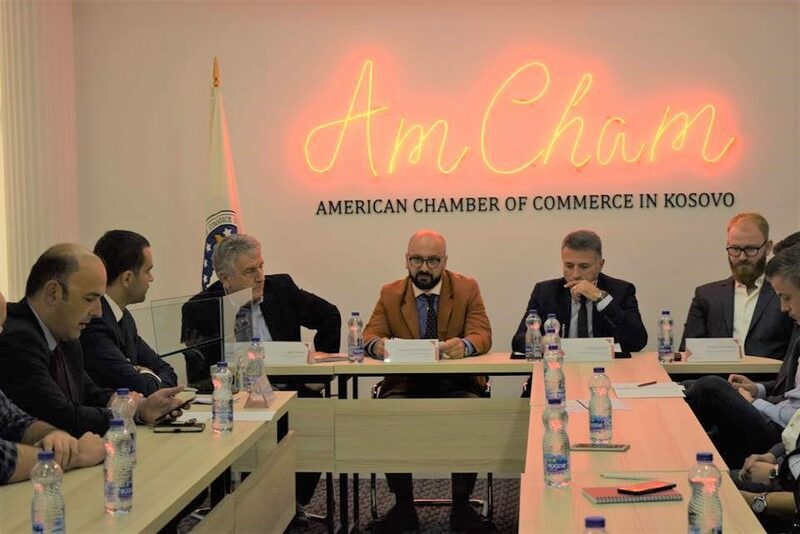 Executive Director of the American Chamber of Commerce, Arian Zeka, initially said that citizens and businesses are more aware of the benefits digital economy brings to the country, however, discussions that furthermore focus on cyber risks remain few. He mentioned some active organizations in this area such as the Innovation Centre Kosovo, adding that since businesses tend to be the objectives of cyber attacks, AmCham is also active in this aspect. Deputy Minister of Internal Affairs, Selami Shkodra, said that the Ministry of Internal Affairs and the Government of Kosovo are aware of the growing rate of cyber crimes, therefore they remain active in undertaking necessary measures on responding to such possible cases. Chief of Cyber Crime Investigation Sector from Kosovo Police, Fadil Abdyli, said that Kosovo Police besides its focus on crime investigation it is also committed to informing businesses about possible risks that they could face, and also in providing guidelines on taking measures in avoiding cyber attacks. He said that this year has registered a higher number of potential cyber attacks, therefore businesses should be aware and increase information technology systems security. Agim Bekaj, Country Representative Microsoft, talked about the importance of licensed computer systems and the risks that arise from pirated software. On the other hand, Drinor Selmanaj, founder of Sentry and active lecturer in cyber-security area, mentioned current forms of cyber threats and safety measures that businesses and their employees should undertake in order to actively ensure cyber-security.